I was recently gifted a sample of the new range of Yarra Valley Cheese fresh cheeses from the lovely Mel at Squawk Media, and wanted to make something a little special with it. 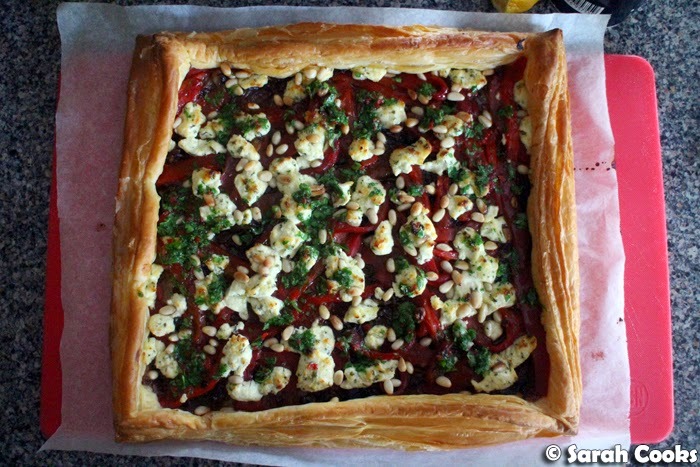 Y'all know I never need an excuse to stuff my face with pastry, and I thought a light and fun springtime tart would be a good use for the cheese. 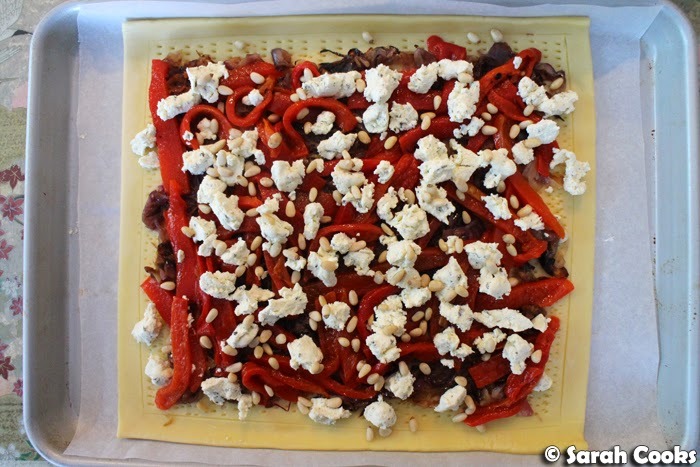 Next comes a sprinkling of pine nuts and your fresh cheese. 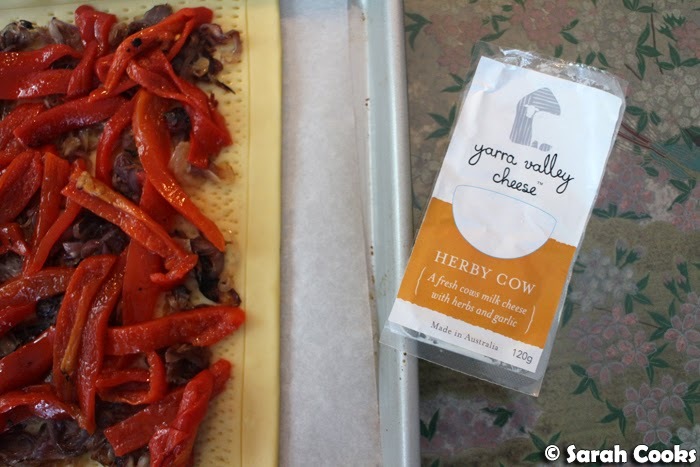 I used the "Herby Cow" fresh cows milk cheese that Yarra Valley Cheese sent me, which has herbs and garlic mixed through. I believe this cheese will be coming to supermarkets soon, but you could use any fresh cows milk cheese as an alternative. (E.g. quark, queso fresco, Boursin etc.) Of course, you could use chèvre goats cheese, which has a similar texture and is manufactured in the same way, but that is made of goat milk, so it will have that distinct goaty flavour. 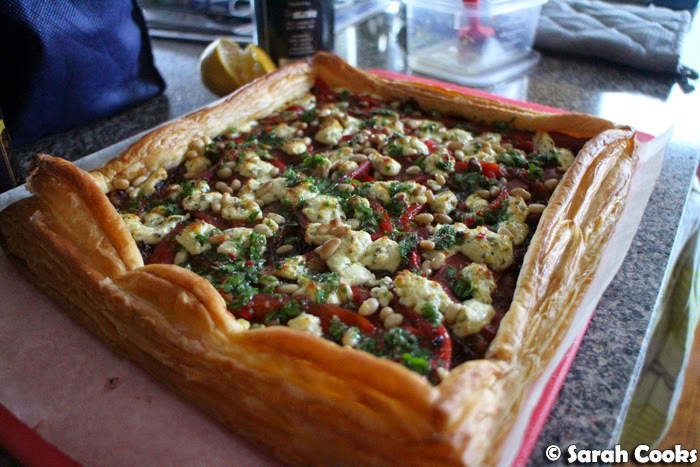 Then bake it until the pastry is all puffed up and cooked through, and the pine nuts and cheese are lightly golden brown. Then you brush it with the garlic / parsley / chilli / olive oil mixture, cut into slices and INHALE. Whilst being very impressive, it is quite easy to put together, and it's more about assembly than labour-intensive cooking. 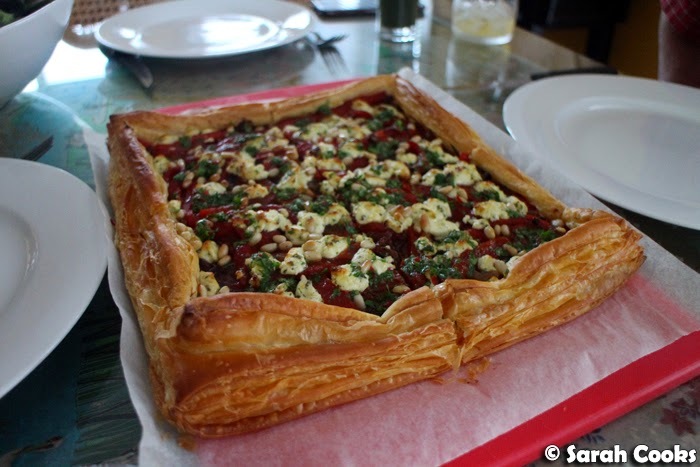 In fact, I made it for a weeknight dinner for my parents - I prepped the ingredients at my own home after work, then took all the ingredients to their place, assembled the tart and baked it. It was really a low stress affair! I imagine leftovers would be good either cold, or reheated in the oven, but don't count on having any. 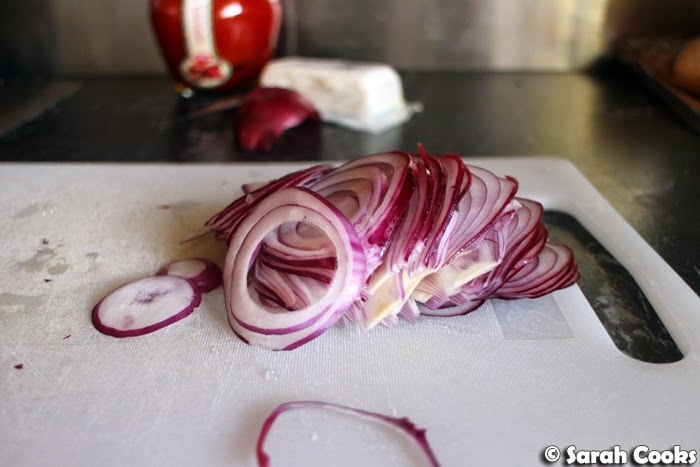 Peel and finely slice the red onions (a mandolin is useful here). Heat a drizzle of olive oil in a non stick pan and add the onion slices. Cook on a low heat, stirring occasionally, until the onions have cooked down and are soft and golden brown in parts. Set aside to cool. Place the pastry on a lined baking dish. Using a sharp knife, trace a 1 centimetre border around the edge of the pastry. Within the borders, prick the pastry all over with a fork. Arrange the caramelised onion over the pastry. 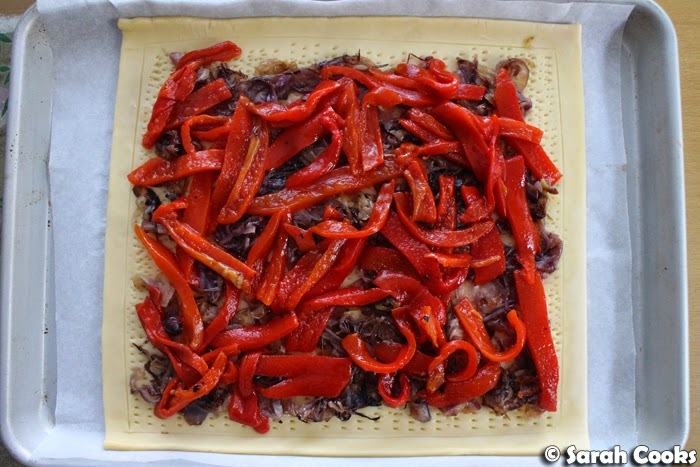 Drain and roughly slice the roast capsicums, and arrange over the caramelised onions. Crumble the cheese over, followed by the pine nuts. Bake for 20-25 minutes, or until the pastry is golden brown and cooked through. Meanwhile, finely chop the garlic, chillies and parsley, and mix with the tablespoon of extra virgin olive oil. When the tart is cooked, brush it with the olive oil mixture. Cut into slices to serve. Sarah received the Yarra Valley Cheese Herby Cow as a complimentary sample. Tarts like this are my go-to if someone surprises me for lunch. I LOVE this tart! Sarah, looks heavenly and so simple! 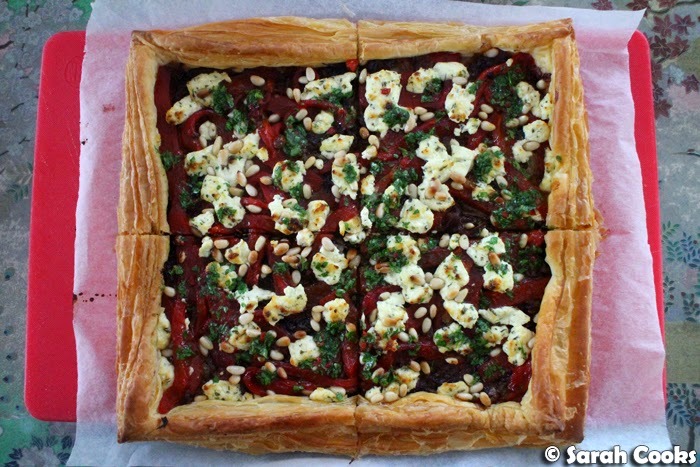 I love the simplicity of this tart! This will be one of my favorites. I better give this a try!